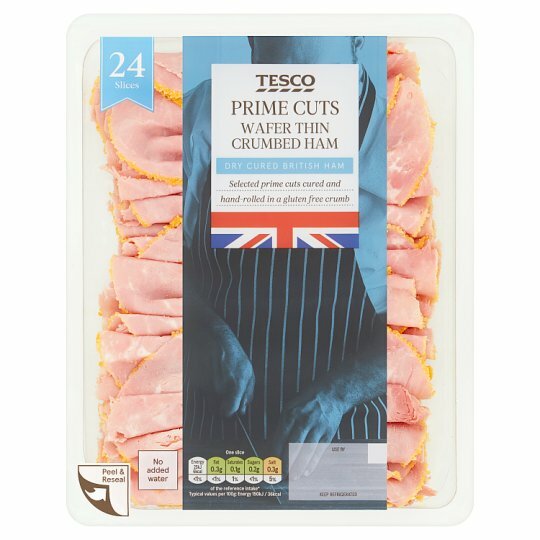 Wafer thin sliced, cured and cooked formed ham made from selected cuts of pork leg meat, coated with gluten free breadcrumbs. Made with British Pork Selected prime cuts dry cured for flavour. We work with a long established group of dedicated farms using hand butchered selected cuts of pork leg. The pork is then dry cured for at least four days to give a fuller flavour and succulent texture. INGREDIENTS: Pork (98%), Salt, Brown Sugar, Stabilisers (Potassium Triphosphate, Sodium Triphosphate, Tetrapotassium Diphosphate), Gluten Free Breadcrumbs [Rice Flour, Maize Flour, Maize Starch, Salt, Rapeseed Oil, Colours (Paprika Extract, Curcumin), Dextrose], Mineral Sea Salt, Pork Gelatine, Preservatives (Sodium Nitrite, Potassium Nitrate), Antioxidant (Sodium Ascorbate).